At the start of the twenty-first century, 1 percent of the U.S. population is behind bars. An additional 3 percent is on parole or probation. In all but two states, incarcerated felons cannot vote, and in three states felon disenfranchisement is for life. More than 5 million adult Americans cannot vote because of a felony-class criminal conviction, meaning that more than 2 percent of otherwise eligible voters are stripped of their political rights. Nationally, fully a third of the disenfranchised are African American, effectively disenfranchising 8 percent of all African Americans in the United States. In Alabama, Kentucky, and Florida, one in every five adult African Americans cannot vote. 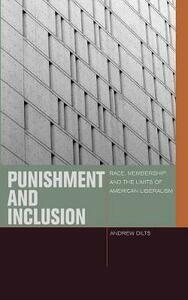 Punishment and Inclusion gives a theoretical and historical account of this pernicious practice of felon disenfranchisement, drawing widely on early modern political philosophy, continental and postcolonial political thought, critical race theory, feminist philosophy, disability theory, critical legal studies, and archival research into state constitutional conventions. It demonstrates that the history of felon disenfranchisement, rooted in postslavery restrictions on suffrage and the contemporaneous emergence of the modern "American" penal system, reveals the deep connections between two political institutions often thought to be separate, showing the work of membership done by the criminal punishment system and the work of punishment done by the electoral franchise. Felon disenfranchisement is a symptom of the tension that persists in democratic politics between membership and punishment. This book shows how this tension is managed via the persistence of white supremacy in contemporary regimes of punishment and governance.